DD5LP/P – December 6th. 2017 DM/BM-374 Wuelzburg (first activation). As the title states, this was the first activation of this summit. A few summits were added to the DM association on December 1st. 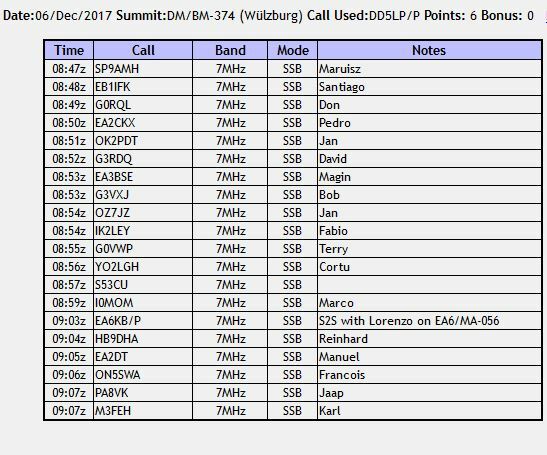 2017 and while this was a surprise, I took a look at them all and realised that Wuelzburg would be well within my capabilities to activate (others were a lot further away or difficult to access or were wooded summits, which can cause transmission problems). 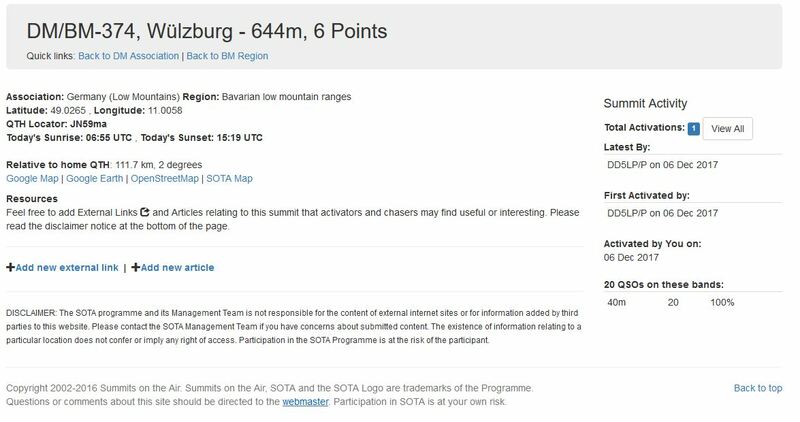 I have been the “first activator” of a new summit in VK2, Australia (VK2/HU-093 Mt Elliot) and had a chance to activate a new Austrian summit about a year ago but I waited too long and another activator got there first! With this summit, I was unable to get there in the first few days due to bad weather conditions. I kept an eye on SOTAWatch spots and alerts and luckily no one decided to activate Wuelzburg, so as the weather improved, I decided that December 6th. (St. Nikolas day) was going to be “THE DAY”. I planned my route, programmed the GPS and loaded all the usual equipment into the car the night before, so that I could get an early start. Wuelzburg (Burg meaning castle or fortification in German), sits on a steep-sided hill above the town of Weissenberg about 1 3/4 hours drive away from my home QTH. So in no means a “local” summit for me – however in this case the route was all major roads. Only the last 3 km or so was up country roads. The “fortress” itself is open for public tours during the summer and has a car park near to the gate to the castle. The castle and car park sit on the flat-topped hill and so anywhere you go along the walking track around the castle walls or within the castle walls, is well within the SOTA activation zone. The weather forecast from the previous day was for some sunshine and the temperature warming up however on the morning this was revised to be cloudy with drizzle but at least with temperatures above the freezing point. So no ice on the roads thankfully. The journey up was uneventful and went at a good pace except on approaching Augsburg from the south where the traffic slowed to a crawl. This was not an accident, simply the normal morning traffic overloading the road’s capacity. Once past Augsburg it was possible to cruise at around 100 km/h again. There were some delays on the two lane part of the B2 highway with trucks limited to 80 km/h and no safe places to pass and road works where a bridge has been in repair mode for the last 6 months but all in all a good run. I made only one mistake, taking an exit too soon from the B2 road at Weissenberg and the GPS constantly wanted to re-plan the route. Once I realised what was wrong, I got back onto the B2 and then took the next exit (which was already signposted to Wuelzburg!). On arriving at the castle, I was surprised to find the car park almost full but not a lot of people around. My guess is that some kind of course was being held using the buildings within the castle walls. When there’s little public interest in winter, it makes sense that they use the facility for something else. From the car park, I could see some seating, which turned out to be a platform overlooking the drop down into the Altmuhltal valley. This was probably about 100 metres from the car park and the route up there could be made with a little difficulty by a disabled activator in a wheelchair if required. There are also other green areas around the castle that would also be suitable for activations without any large hindrances in the way. As you’ll see from the pictures, it was still quite misty when I arrived and stayed that way until I left. My feeling is that it was only a degree or two above zero and there was a wind meaning it felt cold (which in the end limited how long I stayed). After setting up the linked dipole on the 6 metre fishing pole at the wooden lookout platform, I was surprised to find lots of stations on 40 metres. There wasn’t a contest as far as I know, so I can only assume that several people have already started their Christmas holidays and were on the air. I tuned around and found 7.130 clear and so spotted myself and started calling CQ SOTA. At 08:47 UTC Mariusz SP9AMH was the first to come back and told me something was wrong with my audio. I turned off the RF compressor that is built into the microphone and he then said all was fine. Of course with the compressor off I lose 50% of my signal “punch” so I need to look at what has happened there – perhaps the cold has affected the electronics? I ran the complete activation with the compressor off in any case. In total I had 20 contacts, the best being an S2S into Mallorca. As I expected, I was getting worse reports than normal but I was getting out, which was the main thing. As time went on I was getting colder and colder, so when the calls eventually dried up at around 09:07 UTC, I decided to call it a day and pack everything up. The run home had less delays from traffic but strangely seemed to take longer (which it didn’t). I was home just after Noon local time. I had achieved what I set out to do – to be the first station to activate a new summit and in the process I also broke the 500 activator points, something I have been trying to do over my last few activations. Cell phone coverage at this summit at first looked to only be “Edge” (2G) from the car park however from the lookout platform, Vodaphone got a 4G link so that was fine. Band conditions were very average but there is no QRM at this location, so signals down to S1 were audible. Given that this summit has no winter bonus, it would make a nice summit to visit in summer, to be combined with a tour around the fortress perhaps? Modified QAMP amplifier (30-35W on 40m). Although there are no extra points for being the first activator of a summit, it’s nice to have one’s name at the top of the list. The 6 points from this summit were also nice to break that “HALF-GOAT” 500 point barrier. On the equipment side, I need to look into what is wrong with the in microphone RF-Clipper as the extra punch is very important when one has a weak signal. I also need to service the much suffering SOTABeams band hopper linked dipole. The tape I used to keep the coax coiled refused to come off without splitting, so I need to use a different type next time. The cloth type doesn’t dry up or crack in the heat or cold but if it wont come off and re-stick easily when I need it to with my cold fingers, I will have to find something better. Perhaps a Velcro tie? This entry was posted in SOTA and tagged DM/BM-374, SOTA, Wuelzburg by VK2JI DD5LP G8GLM. Bookmark the permalink.